Our new marching season has begun. Show is entitled: "THE BEST YEAR" which will include Lady Marmalade from "Moulin Rouge", The Best Years of Our Lives from "Shrek", Love Shack and Louie Louie (a Yorkton tradition). Rehearsals have begun on Friday mornings at 7:30 a.m. Join us for a great season of marching. Plans are being made to perform for the Saskatchewan Roughriders.... Saturday, May 31st at 7:30 p.m. O Canada and a Half Time Show "Best Years" will be performed. GREY CUP 2002 in Edmonton? 160 students and 20 chaperones are planning a weekend trip to Canada's Super Bowl. Grey Cup Parade - 12 noon Sat. Rendevez Regina performance - Shaw Center - 4 p.m. Sat. Free time....West Edmonton Water Park and more! Music to be performed included: Jump, My Sharona, Cartoon Favorites, YMCA, St. Elmo's Fire, Canadian Heritage March, Rock and Roll #2, Shorties #3 and O Canada. The YRHS Marching 100 Raiders performed at the RCMP Musical Ride on Saturday, August 31st - 1:30 p.m. and 6:30 p.m. in support of the East Central Health Foundation. This was a special fundraising event for the community so we were pleased to participate. Thanks to all those who performed! practice on Friday mornings at 7:30 am! The YRHS Marching Raiders Spring show for the 2002 season was titled "A TRIBUTE TO TITO PUENTE". Mr. Puente was a latin/Cuban percussion who influence many jazz musicians. We look forward to this rhythmic show. Performances included: May 23 at Kinsmen Century Field Exhibition - Guest bands included two Regina Lions Bands. 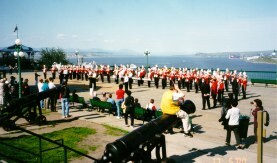 The following night, Saturday, May 25th, the marching bands performed at Taylor Field for Springfest. A combined band of YRHS and Yorkton Public Schools students for the Yorkton Exhibition and Lions Kiddies Parades was very successfull. Thanks to all the students and parents who helped with these events.